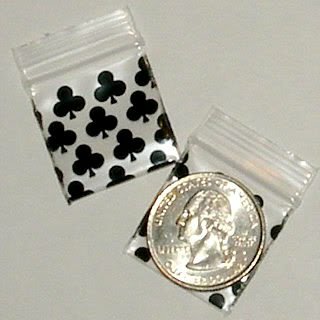 200 Baggies Black Clubs design 1010 small ziplock bags 1 x 1"
200 Baggies Black Clubs design. Size 1010, 1 x 1 inch, printed on one side, other side clear. The quarter is only to show the size. Many more Apple® brand bags, in various quantitiesand multiple designs and colors in my eCRATER store. Free shipping to any US address. 200 Heavy D Baggies 125125 Apple® Brand Bags 1.25 x 1.25 in. 200 It's 4:20 Baggies 125125 Apple® Brand Bags 1.25 x 1.25 in.